A day after Super Typhoon Yutu slammed into the territory that is home to 50,000 people, residents on Friday picked through destruction ranging from collapsed houses — including some built to withstand typhoon winds — to snapped utility poles blocking waterlogged roads. They braced for months without power or running water. A 44-year-old woman taking shelter in an abandoned building died when it collapsed in the storm, the governor’s office Facebook page said. Officials couldn’t immediately be reached for additional details. The territory’s only hospital in Saipan, the most populated island, said it received 133 people in the emergency room Thursday, and three patients had severe injuries that needed surgery. Officials toured villages in Saipan and saw cars crushed under a collapsed garage, the ground ripped clean of vegetation and people injured by spraying glass and other debris. But residents “were stoic and still smiling, and they were just thankful to be alive,” said Edwin Propst, a member of the territory’s House of Representatives. “This damage is just horrendous. It’s going to take months and months for us to recover,” he said by phone. The agency had already significant water and food in place because it had stored more than 220,000 liters of water and 260,000 shelf-stable meals at a distribution center on nearby Guam to prepare for Typhoon Mangkhut, which struck last month. Mangkhut’s effects turned out to be not as bad as expected, so those supplies are still available. 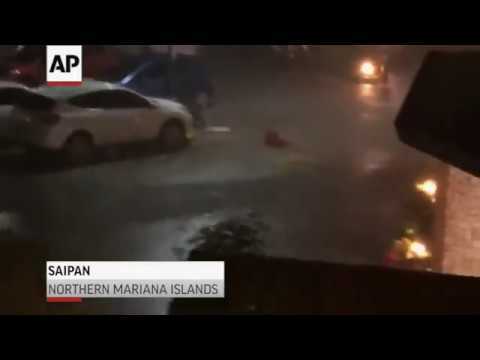 Nadine Deleon Guerrero, a spokeswoman for the territory’s emergency management department, said all of Saipan (population 50,000) and Tinian (population 3,000) islands are without electricity. Commercial flights won’t be operable for some time, she said. The islands’ emergency management agency said it was trying to clear roadways so first responders could help residents who lost their homes and people could get medical care and head to shelters. Hunter peeked outside and saw his neighbor’s house, made of wood and tin, completely gone. The 45-year-old has lived on Saipan since childhood and is accustomed to strong storms but said Super Typhoon Yutu is the worst he has experienced. Hunter said he doesn’t expect to get power back for months, recalling how it took four months to restore electricity after Typhoon Soudelor in 2015. “I have never seen anything like this in my life, and I have been through major typhoons,” said Sablan, the congressional delegate. Some poor families can’t afford homes that conform to building codes, Propst said. Some build houses with concrete foundations and walls but that have wooden and tin roofs. Jones and Kelleher reported from Honolulu.